South Sudan’s President Salva Kiir has reportedly granted amnesty to 750 troops loyal to his main political rival and the country’s former First Vice-President Riek Machar. Those pardoned crossed in to neighbouring Democratic Republic of Congo (DRC) when fighting erupted in the capital, Juba in July this year. 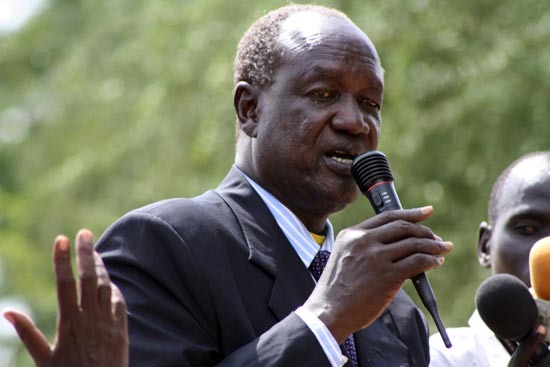 Local media reports quoted South Sudan’s Defence Minister Kuol Manyang saying the Juba regime was ready to welcome the armed opposition forces residing in refugee camps in DRC. “The President of the Republic made an amnesty for those who will be ready to come back and this is the message we were carrying to the authorities in DRC,” Manyang was quoted as saying. 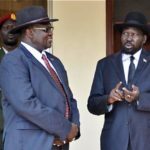 A team, the minister disclosed, would be sent to convey the amnesty message to the rebels, whose leader declared armed resistance against President Kiir in September. “Those who will want to go back to the army; we will send them to contentment sites where they will be screened. And those who will want to be in the police, will be re-trained,” added the minister. Violence broke out in South Sudan’s capital in July when the two rival forces clashed, leaving hundreds dead and thousands displaced. The incident forced Machar to flee Juba into the DRC. The Defense Minister, however, said Machar who is currently in South Africa, would have to denounce violence before he is allowed to return into the young nation. Tens of thousands of people have been killed and millions displaced since conflict erupted between South Sudan’s main rival political factions in December 2013. Meanwhile, the South Sudanese armed opposition (SPLM-IO) forces Wednesday claimed the capture of three localities in southern and northern parts of the country following heavy fighting. 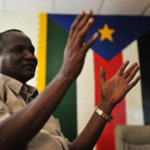 In a statement to Sudan Tribune, SPLA-IO Spokesperson William Gatjiath Deng said their fighters clashed with the government army and captured Bazi at the South Sudan-DRC border, Morobo in Central Equatoria and Kaljak in Unity state.